Search for buried treasure in Illinois. Illinois has stories about gangster and mafia treasures, riverboat treasures, and caches buried by family members. People from all walks of life have discovered buried, or hidden loot. Some of these individuals have been lucky enough to accidentally discover them. However, others, with the right knowledge have located treasures while searching for them. If you are interested in discovering a cache yourself, then you’ve come to the right place. This page, and throughout the hundreds of pages at my website is all of the information you need to get started on your search for buried treasure. I have also provided links to hundreds of other websites and articles. Your search for buried treasure in Illinois could also start in this area. Begin your search with the stories below. The Cave in the Rock Treasure is supposedly $200,000 in gold and silver coins. The cache was buried by stagecoach outlaws. It has been reported that the treasure is hidden in a cave near the western bank of the Ohio River, near the town of Cave. It has also been reported that after rain storms gold and silver coins have been found along the river banks. Near Golconda, along the west banks of the Ohio River, hundreds of American silver dollars from the 1800’s have been after flooding. The coins may be from a wrecked Riverboat. Tonti The Frenchman was a paymaster for the French during the French & Indian War. Supposedly he buried a treasure of gold coins worth approximately $100,000 in the area near Starved Rock on the Illinois River. Apparently the cache was buried somewhere between LaSalle and Ottawa. The gangster Sam Anatuna buried a metal box containing $400,000 in paper currency somewhere near Route 66, a few miles south of Braidwood. Another gangster, Mafia king, Vito Giannola operated a still on his farm near Horseshoe Lake. A gang war took his life, but before he died it was reported that he buried twelve, waterproof, lunch buckets filled with money, somewhere on his farm. If your search for buried treasure will take you onto State Land, then it's important that you be aware of this law. 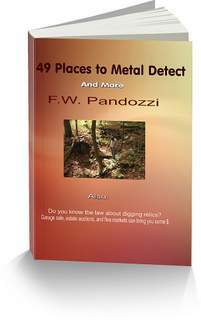 Do you watch metal detecting, TV shows? I was the first to produce a TV series all about metal detecting.